The key to making perfect fried rice is using cold leftover rice. There’s a really great Thai restaurant in Williamsburg, Brooklyn I used to go to all the time called Sea that has a great vibe and a DJ. I always ordered the fried rice because it’s just amazing! I was on a mission to make this myself, and after researching and experimenting, I managed to get very close. Thai fried rice gets it’s unique flavor from the fish sauce, soy sauce and chili peppers. The jasmine rice is a must! Although here I used chicken, I’ve also made this with shrimp, beef or pork. Enjoy! Thai fried rice gets it’s unique flavor from the fish sauce, soy sauce and chili peppers. The jasmine rice is a must! Heat a large nonstick wok over high heat. Meanwhile, season chicken lightly with salt and pepper. When the wok is very hot, add 2 tsp of the oil. 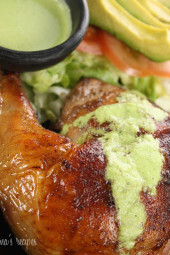 When the oil is hot, add the chicken and cook on high until its browned all over and cooked through, about 3-4 minutes. Remove chicken from wok and set aside, add the eggs, pinch of salt and cook a minute or two until done. Set aside. Add the remaining oil to the wok and add the onion, scallions and garlic. Saute 1 minute, add the chili pepper if using, tomatoes and stir in all the rice. Add the soy sauce and fish sauce stir to mix all the ingredients. Keep stirring a few minutes, then add egg and chicken back to the wok. Adjust soy sauce if needed and stir well another 30 seconds. OMG! This is fantastic! The flavor is incredible and the portion size is huge. I did sub out the chicken for shrimp tonight. I know whats for lunch tomorrow! just for curiosity, i am trying to eat more quinoa and was wondering if substituting rice for quinoa would work? please advise. Must one use a wok? Honestly, i was scared of the fish sauce. But let me tell you, this recipe was AMAZING!!! Definitely a new favorite. Thank you Gina for all that you do…you're a lifesaver! Hi what kind of beef would you use with this? This is my favorite meal, hands down! I add zucchini with the onions and it tastes just like a Japanese steakhouse! I just made this and substituted tempeh for chicken and a jalepeno for the chili peppers. YUM! Made this last night. Hubby devoured it and had 2 FULL servings! Only changes I made were no tomatoes and instead I used up all the baby red peppers from my backyard pots. And added 1 small shredded carrot – just because I had it. Made it with some cut up pork chops I cooked the night before and I cookded the rice the night before, too. So all I had to do was chop the veggies and then cook it. Simple, tasty and filling. Tried this last night with a few shortcuts and tweaks. One thing though 3 cups of rice is a whole lot! Make sure you have a large enough Wok and appetite. I'm really looking forward to trying this. My boyfriend is from Sri Lanka and he loves his fried rice. Unfortunately it is normally soooo bad for anyone trying to cut back on calories and fat. He will be tickled to have it back on the menu every now and again. 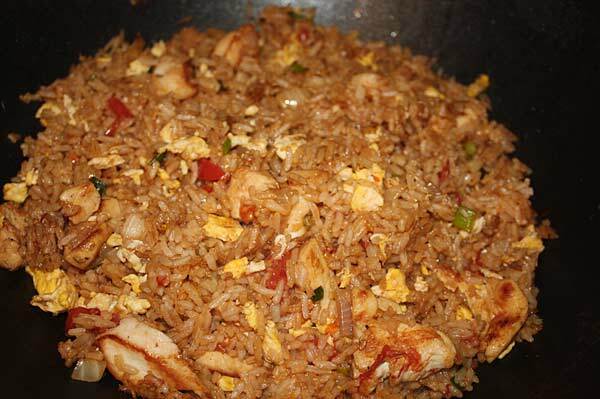 JD – I have made fried rice before in a large skillet in the past when my wok was packed away. Biggest thing is just to make sure it stays HOT and keep the food your cooking in the center (as the edges tend to be off the burner and cooler) and keep it moving. be done in a skillet? Don't have no wok, don't want no wok. them. 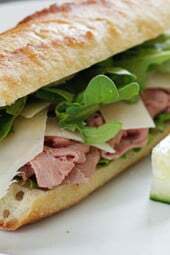 Enjoy your site, many recipes to explore. Thank you for sharing. I made this for my family last night and it was tasty. Gina, I made this dish tonight and omg it was just wonderful, everyone in my family loved it, ty very much! Love this! It is great with extra veggies, basil and the oyster sauce is a must! YUM! Basil would be great here! One word for this dish: AMAZING! Oops, too spicy! Thanks I am happy you are hooked! Yum!! Love Thai food, so I couldn't pass this one up. I added broccolli, bell peppers,and mushrooms for more bulk. I substituted serrano peppers for the Thai chilis,seeds and all…Fyi,it was spicy! So spicy my bf couldnt finish 🙁 but I sure did! Gina,i stumbled upon your site a few months ago,and am now HOOKED!!! 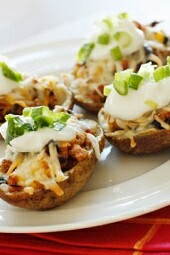 Seriously Love love love your recipes,followers,and tidbits of info.You are awesome! Another big hit with my family. So much flavor. I added water chestnuts just because I like some crunch! My hubby actually asked me what we were having from your site tonight for dinner! You have totally won him and my boys over. Thank you so much. This recipe was amazing! I made a couple of substitutions to fit my taste and what I had in my pantry (carrots instead of tomatoes and red pepper flakes instead of Thai chili peppers and left out the fish sauce altogether). This recipe was easy, delicious, and the leftovers were GREAT for lunch! I'm absolutely in love with your entire website. I love to cook and being on WW, I thought I would have to cook not so fun dishes…I was wrong! Thank you for posting such delicious items for my whole family to enjoy and stay healthy at the same time! Gina, Just like so many of your other readers have said, I LOVE this site! You have definitely made cooking light possible. Re: this recipe. I don't have a wok. Should I just skip the recipe (or buy a wok :), or would a large sauté pan do the trick? excellent recipe made this tonight and was delicious!!! Gina, this is a favorite among my family. Could you possibly update the points? By the way, my family has been very satisfied with all of the recipes I have used from your site. They prefer your recipes to the Weight Watchers recipe!! Thanks so very, very much for all you do! HAPPY HOLIDAYS! Hi Kim, 3 cups cooked rice, not 3 cups raw rice, that would yield too much rice and increase the points. I just found your website and I tried this last night. It was SO good. Next time I will leave out the tomato and put in Pineapple instead, and I bet it will taste just like my favorite dish at my favorite Thai restaurant. Thanks so much. It is really tasty and WAY less greasy! This is the second time that I had made this dish. It's a very good a filling dish. Your site, at least for me, is the sinlge biggest thing that makes following WW possible. Thank you for all the great food options!!! very tasty recipe….hubby loved it…. Pork tenderloin cut up small might make a lean option for pork. I made this tonight with pork instead of chicken – the points went up considerably, but it was great! I couldn't find thai chili peppers, so I just threw in a pinch or two of crushed red peppers. I also added some frozen peas at the end for color. This was great! My husband doesn't care for anything that is low fat/WW but I made this without telling. He loved it. Thank you so much. I haven't made this in a while, thanks for reminding me!! I think I'll make it again this week! This is my new fave!! I have made several of your recipes including skinny meatballs, pepper steak, Sante Fe chicken, and spicy Thai beef/Jasmine rice. So far, my husband and I love them all!! He hardly realized he's eating light! I am so thankful I found this site. You have such delicious flavorful recipes. This was DELICIOUS !! I LOVE your website. Thank you sooo much. I'll definitely be making this again. I made this last night with basmati rice (it's what I had in the cupboard) and it was goooood. I hade to spice it up a little bit with cayenne pepper, and that's probably because I couldn't find thai chili peppers. 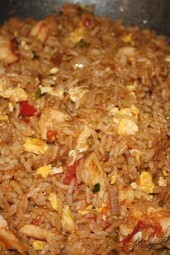 I used jasmine brown rice and a teaspoon of oyster sauce with this recipe and it was just as delicious! Made this last week & wanted to pop back by to thank you for sharing the recipe! It was wonderful & I'll def. be making it again. I have to agree, I love this recipe! I’m a sucker for fried rice!